A Democratic senator questioned one of President Donald Trump's judicial nominees earlier this year over his membership in a northern Virginia church. Trevor McFadden is a Deputy Assistant Attorney General at the Department of Justice, and was nominated in June to serve on the United States District Court for the District of Columbia. 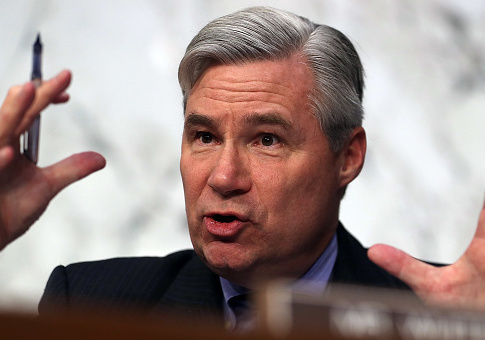 But during his confirmation hearing, Rhode Island Sen. Sheldon Whitehouse (D.) was more concerned about the nominee's attendance at Falls Church Anglican. "You are an elected member (until 2020) of the Falls Church Anglican, which broke away from the Episcopal Church largely due to the denomination’s consecration of an openly gay bishop," Whitehouse asked in a question for the record. "The Falls Church Anglican considers ‘marriage to be a life-long union of husband and wife' intended for ‘the procreation and nurture of godly children' and entailing ‘God-given roles of father and mother,'" the senator continued, pointing out that the church's pastor denounced the 2015 Obergefell v. Hodges decision granting a right to gay marriage. But when asked whether he agreed that the Supreme Court decision conflicted with God's will, McFadden declined to answer. "It would be improper for me to state my personal opinions," he wrote in response. "If I am confirmed as a judge, I will faithfully apply the applicable Supreme Court and D.C. Circuit precedents, including Obergefell v. Hodges," he continued. The questioning of McFadden is not the only recent instance of Democrats focusing on a nominee's religion. Democratic senators also questioned the Catholic faith of Notre Dame professor and judicial nominee Amy Coney Barrett in September. "The conclusion one draws is that the dogma lives loudly within you, and that's of concern…," California Senator Dianne Feinstein said during questioning. Both Barrett and McFadden were eventually confirmed by the Senate 55-43 and 84-10 respectively. Whitehouse did vote for McFadden's confirmation, but only three Democratic senators voted to confirm Barrett. This entry was posted in Politics and tagged Sheldon Whitehouse. Bookmark the permalink.